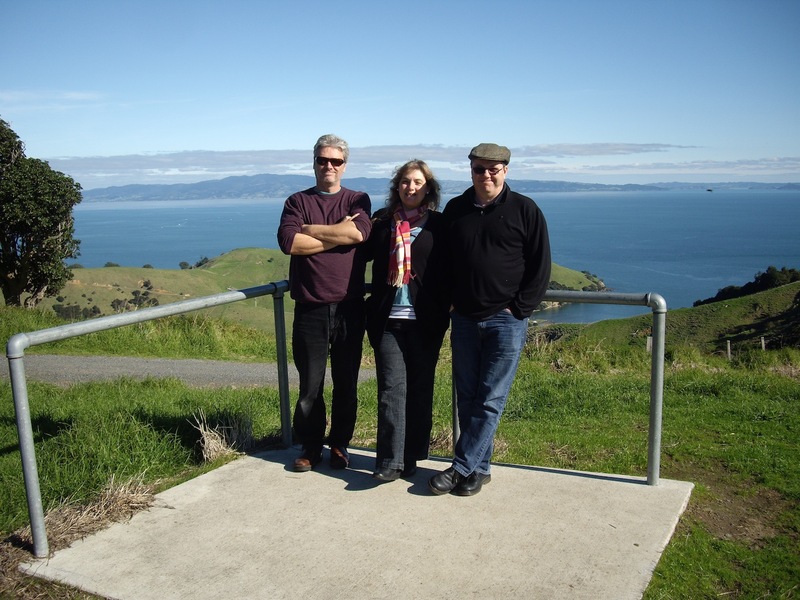 I got a bit preoccupied with organising my electric bike creation last weekend so I put off writing up the Queens Birthday Coromandel trip until now – pretty slack, I know! how crazy do you have to be to spend hours and hours backed up in a traffic jam to get there! I have been to Silvia Park shopping centre and its evident allure is a complete mystery to me. Once we had got past this disturbing suburban horror film/nightmare scene, and overcome the standard fallout argument over who was responsible for us getting caught in the jam, we made it out of the city and into the countryside. The ‘I hate driving and I hate traffic more’ tension inside the car evaporated and we started looking for somewhere to eat. Having dismissed the fast food offerings in the burbs it was now well past lunch time but some things are worth being picky about. We had decided against ‘fuel’ (so called food with little nutritional value or flavour but plenty of fat, salt and e-numbers) and committed to finding an ‘experience’ (either the food or circumstance is worth the effort). A few days before, I had said to the Husband that I didn’t want to Google the hell out of everything we did while we were away. I think it has become a bit of a modern day problem that spontaneity has been replaced by Googling. Rather than going with your gut and allowing serendipity to take a hand, we tend to read reviews and follow the online instructions of someone we’ve never met. Often I wonder whether ‘having opinions’ is also under threat. Quite often when I seek someone’s opinion, instead of their ideas I get the ‘correct’ answer courtesy of the internet. If I was a conspiracy theorist, I might wonder whether our lives are being manipulated by powers unseen! But that way lies madness, and I am not planning to go truly mad until I’m at least in my 90s. I’m sticking with eccentric until that time. Some of my best experiences have been spontaneous so I was eager to see where the road took us. We picked a cafe at random in the next place we came to and, although quite unpromising from first impressions, it delivered the best French toast I’ve ever had. I usually adjust my order a bit from what is offered, which irritates the Husband beyond belief, and it came exactly as I ordered – no cream and with syrup on the side. The breakfast was ground breaking. It turned out to be exactly what it said on the menu – ‘French toast with grilled fruit’. It is the first time I have ever had grilled grapes and kiwifruit but it really works! It was essentially french toast with grilled fruit salad on top – genius! There was no pretentious ‘jus’ or stuff drizzled over it, and it wasn’t covered in icing sugar, chocolate or foliage. Just french toast and grilled fruit – Yum! After that, the day just got better and better. The scenery was lovely and the sun came out. On this trip, we pushed the boundaries just that one step further. The elephant in the room for our Trip is the Husband’s deep seated fear of having nowhere to stay. This translates to always having to organise and confirm everything before hand, which of course is not going to be possible while we’re away. So this time we took a punt. 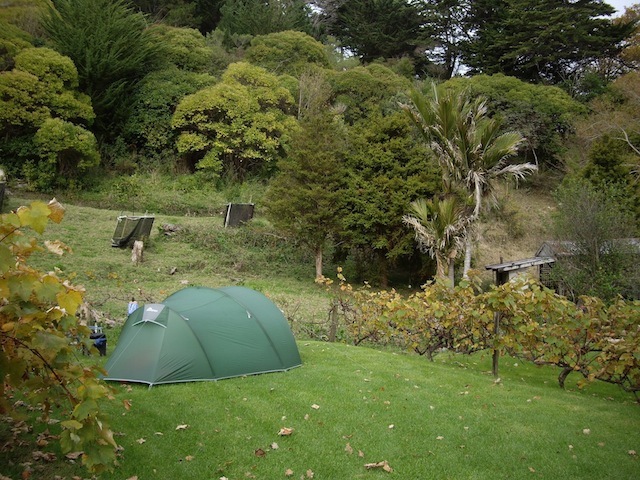 Granted, it wasn’t hugely risky given that we were probably the only people in NZ who were going camping so camp sites were unlikely to be booked out. 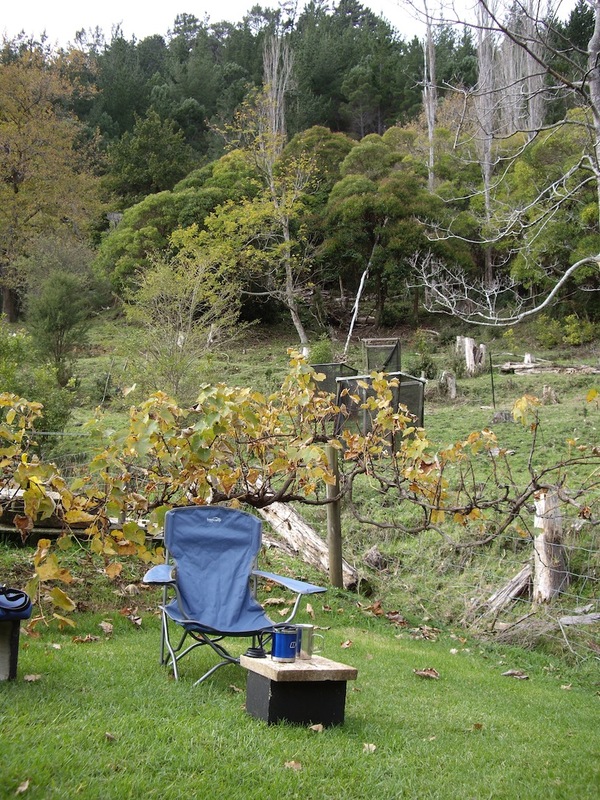 Going camping in winter is not the done thing in NZ, even if the weather is equivalent to a British summer. We also had the offer of our friend’s couch if everything turned to custard. However, we found a very nice camp ground, no problem, and the owner was obviously very perplexed that we didn’t want a cabin and was quite apologetic that she would have to charge us for the pitch – very odd. And, as predicted, we were the only people camping in a tent. I checked when we got home and this was approximately the same temperature shown for Paris over the same weekend. Our pitch was lovely – surrounded by vines covered in autumn yellow and orange foliage and our very own cow just over the fence. Pitching was easy as the ground was soft and this time we only did it once as I ironed out any potential feng shui issues before we committed tent peg to sod. Next was the inaugural cup of tea … an important stage in any camp establishment. Unfortunately, the tea bags had been left in the same container as the mixed herbs so our English Breakfast tea was now infused with oregano, marjoram and rosemary. I would not recommend this blend but you can drink almost anything when camping (those are the rules!). Our new ‘herbal tea’ creation came into its own the next morning when we had run out of milk … as I said to the Husband, “one never takes milk with herbal tea”. Firstly, whether anyone had ever invented puffer knickers to go with the puffer jacket … or perhaps possum or sheepskin shorts? Apparently, Karl Lagerfeld and I think alike and he ‘did’ fur shorts in the Chanel autumn/winter 2010-11 fashion show. Secondly, what to do about the mattress for the following night. We decided the purchase of a very cheap compressed foam mat would solve the problem in the short term and puncture repair could occur at home. The plan was enacted and the following night of course my mattress did not deflate! Conclusion: human error in correctly sealing the exit valve, doh! I did however take the opportunity to point out to the Husband that my stoic suffering during the night had been conducted quietly and with the inner strength that had not been displayed during the Husband’s pillow debacle! Overall, the trip was great. It was fabulous to see old friends again and I now know that I can survive in European May temperatures in a tent. The makeshift piece of nylon that we put under the tent was worth its weight in gold when packing down – mental note: research a proper lightweight groundsheet (tent footprint) to take away. I need to get some Crocks for general camp and shower wear as trying to balance on one leg while very quickly (it was cold) getting into woolly tights and lace up boots is not easy! The second leg is even more difficult and when you add in a wet shower curtain of dubious heritage to the mix, the whole experience prompts urgent resolution! Brilliant! Made me chuckle on multiple occasions – the Google conspiracy theory, the description of yourself as eccentric, the air bed valve, the fur pants (puffa pants would surely make one’s backside look humongous) and the hopping around the shower description. It sounds like a great adventure. Thanks Jo. I was a disparate woman with a very cold bum so the idea of puffer knickers was very appealing but in the cold light of day, I agree they would be less than flattering! Unless of course you were a bum less 6ft model …. Previous Post BUT … cyclopolitans ride bicycles! Next Post What do highly trained assassins and cycle tourists have in common?